Course open – Wednesday 23rd August 2017. The course is now fully opened to trolleys, buggies, surf boards and submarines. Draw for Tri-Am Saturday 26th August 2017. Congratulations to Cambuslang Golf Club Member J.J. Smith who is competing on Sky TV’s Trilby Tour this year. On Wednesday 21st June 2017 he finished 5th out of 117 competitors over the challenging Carus Green Golf Course in Kendal Cumbria. This qualifies him for the Tour Final to be played over Hull Golf Course on 31st August 2017. 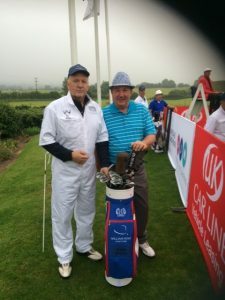 John was ably assisted by another Cambuslang member John Shanks who was his caddy on the day. Their progress can be viewed on Sky sports. Gorman Cup Draw. Saturday 24th June 2017. Updated Constitution after AGM 8th December 2016. This year’s Pantomime is nearly on us and I am not talking about the AGM. Our annual Panto for kids old and new is being held on Sunday 11th December 2016 within the clubhouse starting at 2pm. “Oh no it’s not” I hear you shout , Oh yes it is with adult tickets at £5 and £3 for children. This years pantomime is Aladdin with the original magical bad man, Abanazar. A man so cruel he can turn you into a Prawn Cocktail, and that is just for starters. It may all sound Wishee Washy but as Cinderella said to the chemist who had lost her holiday photos. Someday my Prints will come.